There are lots of shops in Chesham that stock at least one Fairtrade product. However, there are a few shops in town that really excel and stock 4 or more Fairtrade product ranges. These are listed below. Have we missed any? Let us know! Please contact us. You can also purchase Fairtrade goods from local Traidcraft reps in town. 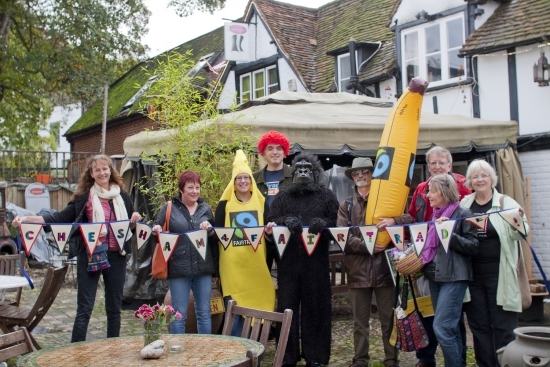 And Fairtrade goods are on sale in a number of Chesham's cafés and pubs. A significant number of the town's businesses, community organisations, faith groups and schools also support Fairtrade. Follow the links to find out more; why not consider making your business or group a Fairtrade supporter? Sells Fairtrade tea and coffee. Serves Fairtrade products wherever possible. Serves fairly-traded tea, coffee and hot chocolate. Welcome to our newest supporters - Chesham Connect and Chesham Allotments Group! Chesham Connectl - the revitalisation group for Chesham and Greater Chesham, working to support and encourage community interest and charity groups that develop and improve the local area. Workaid - Workaid tackles poverty in developing countries by supplying disadvantaged people with the tools they need to earn a living. Disclaimer: Whilst every effort has been made to ensure that the information on this site are as up-to-date as possible, we cannot guarantee the accuracy or completeness of this information (i.e. stocks and policies of businesses and shops may change).